open-S provides for all model years and vehicle types the expertise on the specific, individual content corresponding to the scope of delivery of the vehicle on contemporary material. For illustration purposes, the expertise includes a sticker corresponding to the model year, which corresponds to the sticker affixed at the time in the delivering company. For consultation or submission of a template / data sheet: info@open-s.de - Data cannot be researched - please specify all relevant data. 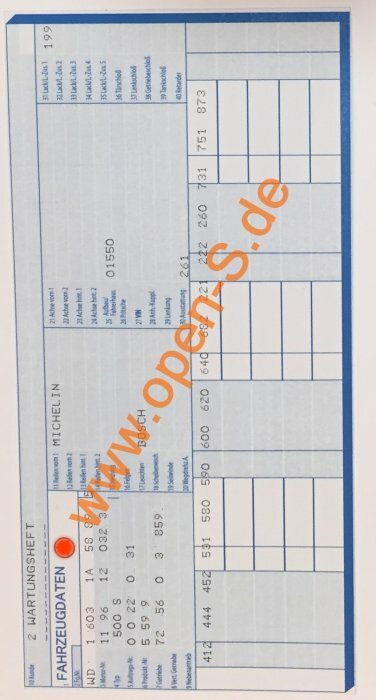 The vehicle identification sticker and a corresponding service book identification sticker were used, for example, for Mercedes Benz vehicles, all model series of the 1990s and 2000s, but also by many other vehicle manufacturers. open-S cannot be held responsible for any use of its offers on products that can be assigned to a certain manufacturer.